Bible Belt Balabusta offers a delightful and creative way to teach about Havdalah. Since slates are obsolete, we could update the tradition by drooling honey onto Tablets and iPads, but chocolate is tastier. At our shul, the kids in Kitah Aleph (first grade) have a Consecration ceremony to mark the formal beginning of Jewish education. They study a theme, put on a play, blurt their entire Hebrew names, then get blessed with their parents under a massive tallis on the bimah. 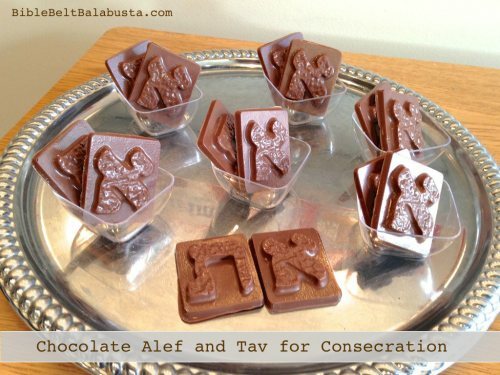 The last couple of years, we’ve added a drop of honey to the tallis time: a drop of honey atop two chocolate letters—alef and tav—that represent the Torah. Fittingly, the school director drips the drop."